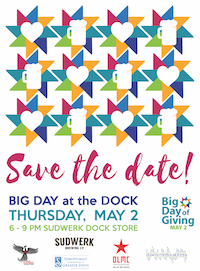 Big Day at the Dock returns this year on Thursday, May 2, 2019 from 6-9 pm at Sudwerk, 2001 Second Street in Davis, as part of the regional Big Day of Giving celebration. Free and open to the public, this year’s event will feature up to 40 local non-profits, live music, food trucks, and beer by Sudwerk. The community is invited to make their Big DoG donations in real time at the event.Forty-five local Davis non-profits are signed up and ready to receive your generous donations including Cool Davis and several Cool Davis partners (see below). Held annually on the first Thursday in May, Big Day of Giving (Big DoG) is designed to increase charitable giving to non-profits in our region. The Sacramento Region Community Foundation spearheads the event, which generated in excess of $7 million last year. Big Day at the Dock is geared at promoting Big DoG and elevating non-profits in Davis and Yolo County, bringing them together in one joyous burst of community and generosity. The event was first produced by Davis Media Access/KDRT, Davis Music Festival, and Sudwerk Brewing Company in 2015. Other organizations joined in over time. This year’s event is organized by Davis Media Access/KDRT; Davis Music Festival; Davis Phoenix Coalition; Soroptimist of Greater Davis, and Sudwerk Brewing Co. The nonprofits in need of your generosity will be located adjacent to the beer garden area at Sudwerk’s Dock Store. Some activities for kids are planned. KDRT 95.7 FM will provide a live broadcast of the event. Contact Davis Media Access Executive Director Autumn Labbe-Renault at info@davismedia.org to learn about sponsorship opportunities.